Most people do not know this, but it is actually the garage door springs which bear the load of the door when it is moving and not the opener. This is the reason why you need to provide effective maintenance and inspection to them. When they are in good condition, your door will operate flawlessly and you will enjoy maximum safety. Even the galvanized garage door torsion springs and extension springs require cleaning with a solvent once or twice a year. It is true that these parts are resistant to rust and corrosion, but this does not mean that they can be left without care. The solvent will help for removing dirt accumulation and lower the risk of rusting even further. The cleaning will contribute to the better operation of the part as well. Proper lubrication is necessary as well. It enables the springs to work smoothly and quietly and this is what all homeowners want. You should pick a lubricant recommended by the manufacturer. It should not be sticky. Otherwise, it will cause dirt to accumulate on the spring. Apply a small amount of lubricant and make sure that it is even. This will help to lower the risk of damage and of torsion or extension spring repair. The springs require testing to ensure that they are sufficiently tight. You need to disengage the garage door opener and lift the door manually half way through. If it stays in place, then the spring system must be in excellent condition. If the door moves downwards, the spring is too loose. If the door goes up, then it is tight. In either case, it will require adjustment. 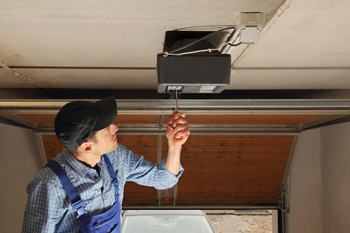 Finally, you have to check the spring system for damage and deformation when providing garage door maintenance. Even the slightest of issues have to be addressed immediately so that the door's operation and safety are not compromised.